It is Wally Berg calling at about 3:30 in the afternoon and I am calling you from Plaza Canada, our first camp on the mountain. 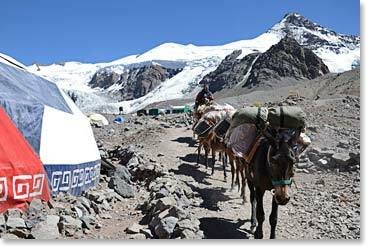 We’ve left base camp behind now and we are really climbing Aconcagua and we have begun our ascent at this point. 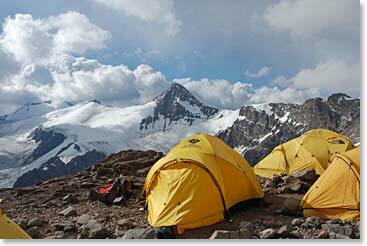 Currently, we are at 16,570ft/5,050m and this campsite is spectacular. The giant rock walls that lead up to Aconcagua tower above us. By the way, the sky is perfectly blue today, not a cloud in the sky. When we look off to the west we see the glaciated peaks of Chile and all the way out to the haze that is out near the Pacific Ocean, which is not that far away—really an amazing spot, Plaza Canada. Back in the country of Canada, we have some dispatch followers who we would like to acknowledge. We said hello to Sofia and Ella the other day, but today we would like to say hello to their classmates and teachers. At Yorkhouse School, Mr. Jones and his first grade class, and Ms. Webb and her fourth grade class are following us up the mountain. We hear that Mr. Jones has been to Mendoza province and is particularly interested in the trip. It is always fun to read about places you have already visited! Well, today is kind of a special day, for several reasons. One, it is my birthday today. Diego, the cook at the restaurant we ate at in Plaza de Mulas, greeted me first thing this morning with, “Happy birthday!” I was really surprised just a little bit later when a birthday cake with a candle was served to me for breakfast. Our entire team, Osvi, Simon, Sergio, Jussi and I, had some cake for breakfast which is a good thing to do when you are climbing to 16,570ft/5,050m. It is a great day to be having a birthday; I’m with great friends and a great climbing team, and I couldn’t be happier. Now, Jussi is really ready to climb; I am sure. He only brought one book to read on this trip Tractutus Logic Philosophicus by Ludwig Wittgenstein. For those of you who have studied philosophy, you will know that it has been an extremely important book for all of the 20th century and now entering the 21st century. I’m pretty sure it contains the collection of the densest sentences cover to cover that you could ever find. It is very heavy duty reading for its size. Jussi proudly announced to me that he finished it last night and he had a great look on his face when he said, “I think I got it.” Then he said, “Mostly.” So with the reading material behind, Jussi and the team are heading up Aconcagua. Now, there is one more thing that is really special about today. Those of you who have followed Berg Adventures in Aconcagua in past years know that tonight is going to be taco night. No one remembers when the tradition began, but it seems like it has been forever that the first night at Plaza Canada has been taco night. Simon is getting his taco fixings ready right now; I can see him over by the kitchen tent getting ready to fix up a good Mexican feast at 5000m tonight. As you can tell, the team is doing great. We are determined to climb much higher; we’ll see how high we can push. We are continuing to have a good time. 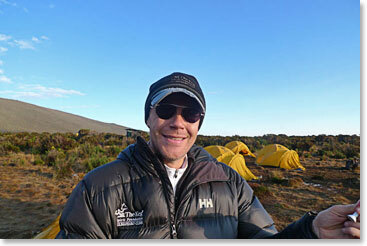 The weather is holding and life is good here at high altitude in Argentina. Mules arriving at base camp as we leave for Plaza Canada, there are no mules allowed where we are going.